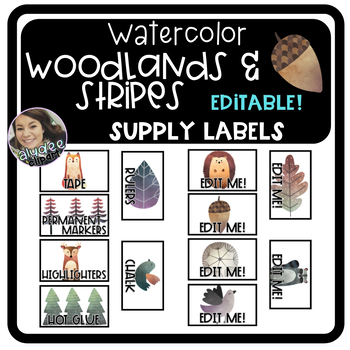 Update your classroom with this ADORABLE Watercolor Woodland & Stripes theme set. This product contains 36 EDITABLE labels to personalize your own supplies. Additionally, it includes 36 pre-made supply labels so you can just print and go. Important: You need POWERPOINT in order to edit this product. Please do not purchase unless you have powerpoint. Be sure to check out additional products in this same themed set! Book Bin/Coat Hook Labels can be found here! Editable desk name plates can be found here! Calendar Set can be found here! Clock Labels can be found here! Alphabet can be found here!